Spiritual Leaves. 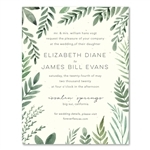 Impress your guests with these beautiful invitations, decorated with delicate leaves in gorgeous watercolors. Printed on premium handmade 100% recycled paper, which will bloom into wildflowers once planted.